The organization responsible for investigating the 1 June 2009 crash of Air France Flight 447, the French Bureau d’Enquêtes et d’Analyses pour la sécurité de l’aviation civile (BEA), released their second interim report on the accident investigation. Although the BEA did not identify one or more causes of the crash, it did conclude that inconsistencies in airspeed measurement led to the disconnection of various flight control systems, the autopilot, and the autothrottle. Similar airspeed inconsistencies had occurred on other A330 and A340 flights, and the BEA performed a detailed analysis of 13 significant events involving five airlines operating these aircraft models. These events had several similarities with the accident flight. They occurred when the aircraft was in an area of unstable air masses with deep convective phenomena, the autopilot disconnected, and invalid airspeeds were reported to the flight control system. However, unlike Flight 447, these five aircraft had altitude deviations less than 1000 feet, and all remained within their normal flight envelope. The BEA concluded that inconsistency in the measurement of airspeeds was one of the elements in the chain of events that led to the accident, though these inconsistencies did not fully explain why the airplane crashed. The BEA has so far not been able to recover the flight data recorder or the cockpit voice recorder. The information from these black boxes, as well as an examination of additional wreckage, may help the BEA figure out the cause of the accident. The second interim report went into quite a bit of detail about what has so far been uncovered in the investigation, and the highlights of that interim report are below. The aircraft aircraft, an Air France A330-200 (F-GZCP), operating and flight 447, was on a scheduled international flight from Rio de Janeiro, Brazil to Paris, France. 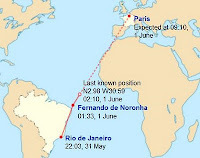 The aircraft departed late on 31 May 2009 from Rio, and crashed in the Atlantic Ocean in the early hours of 1 June 2009. The crash occurred about three hours and 45 minutes after takeoff, in an area of the Atlantic Ocean about 435 nautical miles north-northeast of Fernando de Noronha island. 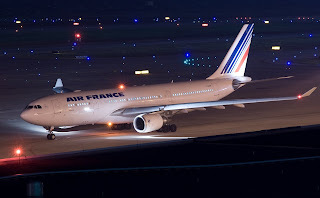 There were no emergency or distress messages sent by the crew, though there were numerous automatically generate maintenance messages that were sent by the aircraft back to Air France. The last contact between the airplane and Brazilian air traffic control happened around 35 minutes before the crash. 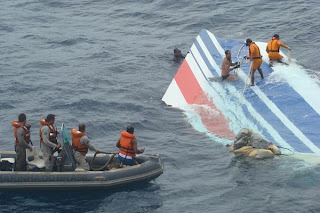 Debris from the aircraft was found near the estimated position of its last radio communication. There were 216 passengers and 12 crew members on board, representing 32 nationalities. A total of 5o bodies were recovered from the ocean, and the remaining passengers and crew are missing and presumed dead. The automated maintenance messages sent by the aircraft back to Air France provided information on the state of the airplane's systems and on the position of the aircraft. Almost all of these messages were linked to faults in the system used to measure the speed of the aircraft. These airspeed measurement issues were discussed in more detail in an earlier AirSafeNews.com article and on AirSafe.com's Flight 447 page. Based on an examination of the recovered debris the BEA reported that the airplane struck the surface of the sea violently, with a slight pitch-up attitude and with a slight bank. The airplane was largely intact at the moment of the impact since the debris found came from all over the airframe. The airplane was pressurized, the oxygen masks had not been released, all of the life jackets that were found were still in their containers, and the airplane’s flaps were retracted at the time of the impact with the water. All of the wreckage that has been located or collected, and bodies that have been recovered had been floating on the surface of the ocean. The investigators also said that 43 of the 50 bodies, which based on their assigned seats were from all parts of the cabin, showed multiple fractures to their spinal columns, pelvises and chests. These injuries were consistent with an upward shock to passengers seated in an aircraft that struck the water belly first. The BEA, with the help of Airbus, Air France, and a host of organizations from the US, Europe, and Brazil, will conduct an undersea search operation scheduled to start in February 2010 and with a planned duration of 60 days.